Earth Day is approaching and some artists thought is would be nice to take their skills to a whole new level and create some unique metal sculptures made of used cars. 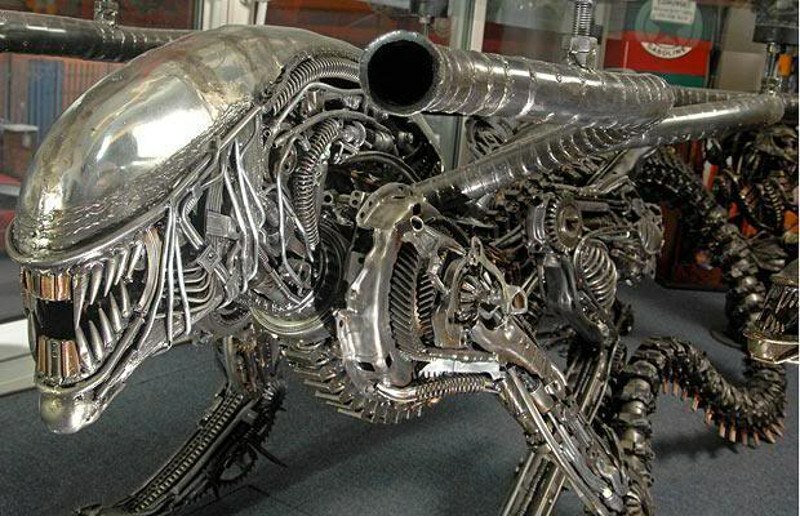 The artists re-used parts from cars that were on the road some time ago and the final results are simply out of this world. Betty Hamblen Turner created “Marathon”, a bull made out of carbon, stainless steel and chrome parts once found on a car. He got a lot of attention for his work and his creation was purchased by the Preserve at Walnut Springs, in Johnson City. Currently, the sculpture is exhibited at the Benini Galleries and Sculpture Ranch. Another artist worth mentioning is Terrence Willment, who brought the famous motion picture character “Alien” back to Earth. James Corbett, from Australia, displayed his work at the United States Pebble Beach Concours d’ Elegance event. His masterpieces are a ram and a puddle that were made from used car parts. Corbett discovered his abilities to mould metal when he was in charge of an auto recycling business. Since then, he started creating all sorts of mechanical wonders from scrapped cars. Jim Shultz, from North Carolina, has dedicated his past 30 years repairing cars’ bodywork. After a while, he decided to use recycled car parts to built one off sculptures and, presently, he is the resident sculptor for the Noisette historic center in Charleston. Born in South Africa, Alastair Gibson chose the car racing world in order to create his sculptures. For 14 years, Gibson was involved in Formula 1 as lead mechanic for the Benetton F1 team, followed by 10 years as chief mechanic for BAR Honda Grand Prix Team. To create a sculptured piranha, Gibson used bits from F1 race cars as well as for his other water themed creations.